I was digging daylilies this morning and it didn’t seem to matter how far down I went, there was still no sign of any moisture. It’s a good thing the daylilies have those thick fleshy roots. They are able to withstand fairly long dry periods by surviving on their stored moisture. The flowers are certainly getting smaller and they are finishing their bloom cycle more quickly. Apparently there is some chance of rain tomorrow but we are not counting on it. Some of “Dallying In The Dirt’s” readers wonder what I am talking about because some parts of the country are having very wet weather while we suffer through this prolonged drought. I have about a dozen daylilies dug up, divided and potted up ready for my plant sale. I start on the Iris tomorrow. They go a bit more quickly because they are happy to stay as bare root pieces and don’t need to be potted. I just have to remember to have a permanent marker to write the variety name on each of the fans that I separate. I found what looked like an Iris borer pupa in one of the clumps of daylily roots but I could find no evidence of damage on any of the adjacent Iris. So I’m confused; actually a fairly common state for this gardener. Wandering around with my watering can, trying to keep the newest plants alive, I found one of the new roses with most of its leaves missing. 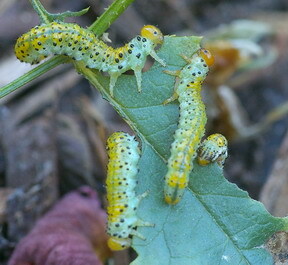 Getting down on my knees to have a closer look found a small army of yellow/green, black spotted, caterpillars merrily chewing away at the leaves. Now being the weird gardener that I am, the first thing I went to get was my, camera so that I could show all of you what I found. Apparently these very hungry fellows are not particularly common because I have been unable to identify them despite considerable research. Help me here readers! As soon as I photographed and identified them I reached fo the bottle of ‘Trounce’ my favourite mixture of insecticidal soap and pyrethrin and gave them a good bath. They were laying on the ground, nicely dead, the next time I went back and checked. I gave the roses a watering with 20 20 20 fertilizer to see if I could encourage them to start growing again and overcome the effects of their attack. We’ll wait and see if they have enough strength to respond and recover. One of them is missing almost all of its leaves so it will be a struggle. I never cease to be amazed at a plant’s ability to recover. I was sent several packages of seed to try this spring and have had varying degrees of success with them. Two stand out as amazing plants, for different reasons. The Tomatoberry, from Johnny’s Seeds, a small fruited Tomato that actually has a shape very similar to a strawberry has been a great addition. It has produced ripe fruit more than a week before any of the other varieties. The fruit has a wonderful fresh Tomato taste and it is quite prolific. I have had to prune, (actually chop severly,) the bushes as they are quite rampant growers that long since left the confines of the cage they were in and are using the peony next door for support. This is easy enough to deal with especially now that I understand them. Their skin is a bit tough but yields fairly readily to a hungry set of teeth. Tomatoberries are definitely worth putting on your , ‘to try’ list. The second interesting plant is Salvia Mojito from McKenzie Seeds, that is supposed to put out white and lime green flowers. The front of the package says it is an annual but the smaller print on the back says that it will bloom the first year from seed. Must be a perennial trying to pass itself off as an annual. I planted several of them in the new front bed thinking they would fill in between the roses. 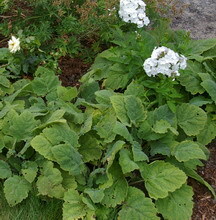 The reason I didn’t see the bugs eating the roses is because this Salvia is doing a bit of a ‘Jack and the Beanstalk.’ Each little plant now has a dozen large leaves and it looks like a semi-tame burdock. I keep ripping some of them out and that just seems to make room for the others to grow even bigger. Here it is 07 August and no sign of any flowers. (The Phlox and the Rose peeking through in the picture are the new plants this "annual?" was supposed to fill between.) It will be interesting to see what they do next year when I leave a few of them in the ground for the winter. The package says to cut back the stems and mulch; very strange instructions for something that has Annual prominent on the front. A touch misleading I feel! Gardening is always full of surprises and new adventures and that’s part of what keeps us at it year after year. Jack asks? My raspberries have finished producing fruit now what do I do? Ken Answers! June bearing Raspberries should be pruned now. Remove all of the old brown canes and leave the new greenish canes to grow for next year. Go to raspberries at my website, www.gardening-enjoyed.com to see a more complete description.